The comfort standards of the air-conditioned (AC) private bus services are on the decline, a new survey carried out by the National Transport Commission (NTC) has revealed. The survey is being used to warn some of the operators to withdraw road unworthy vehicles, while others have been given time to improve the overall condition of the buses. NTC Chairman Roshan Gunawardena told the Sunday Times that the aim of the survey was to improve the efficiency of the luxury bus services and ensure that set standards are met. He said in the first stage of the survey, of the 52 luxury buses operating on the Colombo-Galle route-- the highest number of AC buses operating on any particular route, only 14 met the required standard, while 30 needed repairs, and eight vehicles had to be withdrawn from service. “This is a common situation in most parts of the country where luxury buses are not up to standard. The fare charged therefore was unreasonable. People opt for normal buses, as luxury buses are not in good condition. The normal bus service had better vehicles plying,” he added. The survey found that some of the buses were unsuitable for public transport as they were old. They are overloaded like the normal buses and sometimes take the same time to reach the detination as the former. Insufficient AC levels and use of small 30-seater buses, were some of the reasons for passengers opting for normal bus service. Mr. Gunawardena said they also found that some of the buses switch off the AC midway through a journey, while in some buses the AC water outlet leaks on to passengers, adding that the curtains were also dirty in some of the buses. “Though the AC buses are not supposed to stop in between main halts for passengers, most do, resulting in delays and overloading,” he said. According to statistics on inter-provincial buses maintained by the NTC, in 2002, there were 1,374 luxury buses in the country, which dropped to 667 last year. Now it stands at 480. 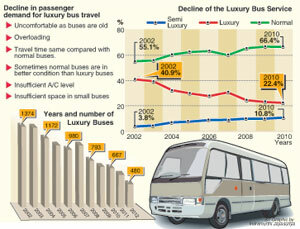 However, the inter-provincial normal buses and semi-luxury buses have increased in comparison to the figures in 2002. Meanwhile Luxury Bus Service Association secretary Cyril Nammuni told the Sunday Times that one of the main reasons for the decline was that the government did not allow the import of new private buses.“The buses which are in operation are over 13 to 14 years old, while the prices of new buses are too high, with each of them costing more than Rs eight million,” he added. “Even if the buses are repaired, they do not last long. We need some kind of a government-assisted scheme to buy new buses for the industry to survive,” he said. However, when the Sunday Times spoke to Private Transport Minister C.B. Ratnayake he said the law would be changed. “We will soon allow the import of new buses to replace the old ones . Loan facilities too will be provided,” he assured adding that the 30-seater buses will be replaced. He said the government’s aim was to improve the present luxury service to a super luxury one. On Thursday, Mr. Gunawardena met luxury bus operators and agreed to implement new measures. Under the new scheme, special halting places will be demarcated for luxury buses, and they will be allowed to drive on the inner lane on main roads. Usually, buses are allowed only on the left lane along with other heavy vehicles. They will also be allowed to detour from the prescribed routes, via alternate routes, to reach their destinations faster, The Sunday Times learns.